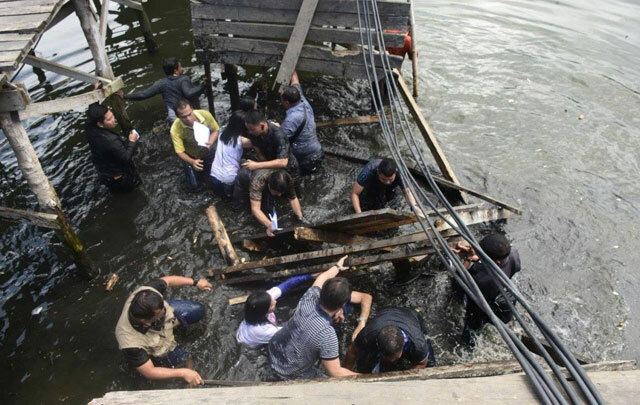 Negros Occidental Rep. Alfredo Benitez, Zamboanga City Rep. Celso Lobregat and Zamboanga Mayor Maria Isabel Climaco-Salazar together with their staffs unfortunately fell in turbid water when they are passing through a wooden footbridge collapsed hours ago.Benitez is currently the chairman of the house committee on housing and urban development. According to a facebook post by the Mayor, they are conducting an inspection on the housing project for the victims of the 2013 Zamboanga siege. Because of this incident, Climaco ordered for an immediate repair of the bridge and demand security forces to ensure order on that area. Benitez also shared his horrific experience to his followers by tweeting that the lack of maintenance on the houses and the bridge is dangerous for the residents especially for children. When Galo Glino III, who is a legislative staff of Benitez, was interviewed by GMA News Online, he revealed that they only got minor injuries. He also said that the incident is an eye opener that they use substandard quality for the housing projects. Despite of what happened, Benitez will continue his activities in Zamboanga City. They visited the city as a part of their committee’s investigation at the housing units for the victims. On a 2 post by the official facebook of GMA News, the images and video from the incident got diverse comments from netizens in social media. As of this typing, the photos got 24 K likes and shared by 39 K users while the video now has 1 M views. A netizen named Ericxon said that they went there to check the condition of the bridge possibly for repair and funding and they got the result with a firsthand experience. Meanwhile, Anmut Daba Oniyuka then stated that it shows the poor quality of their projects. On the other hand, Janet Memoria thinks that accidents happen anytime and there is no one to blame.